Nationally, 80 percent of teachers report that teacher preparation programs need to change. The most frequent complaint is that programs are too theoretical and do not focus enough on the practical techniques that are needed to be successful in the classroom. In fact, principals report that 67 percent of new teachers are not ready to manage a classroom and 72 percent are not prepared to work with diverse student groups. This is particularly troubling because in Minnesota, a significant portion of new teachers start their careers in high-needs schools serving low-income students and students of color. Prioritize increasing the number of teacher candidates of color and recruit candidates for positions where they are needed most. Increase program selectivity to ensure programs produce high-quality teacher candidates and improve the student teaching experience. Improve the quality of the cooperating teacher corps. 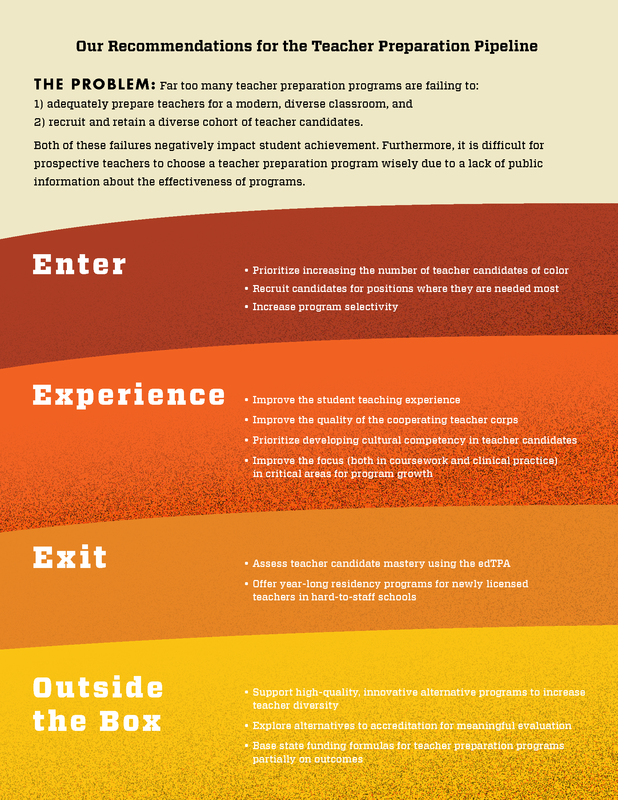 Prioritize developing cultural competency in teacher candidates. Improve the focus on critical areas for program growth. Assess teacher candidate mastery using the edTPA. Offer year-long residency programs for newly licensed teachers in hard-to-staff schools. Support high-quality, innovative alternative programs to increase teacher diversity, explore alternatives to accreditation and change funding formulas for teacher preparation. We are a team of 11 educators who met over the course of three months to review research on teacher preparation programs and recruiting and developing talent. We conducted interviews with teacher colleagues, teacher preparation professors and other education stakeholders to gather critical information about current policies and practices. We also held focus groups, surveyed colleagues, and hosted a large-group listening session to gather feedback and ﬁnalize our recommendations. In total, we gathered feedback from more than 150 educators.